Storm Wind Vizslas, California, Secret - CH Encounter Storm Winds Secretariat, Champion (CH) title. 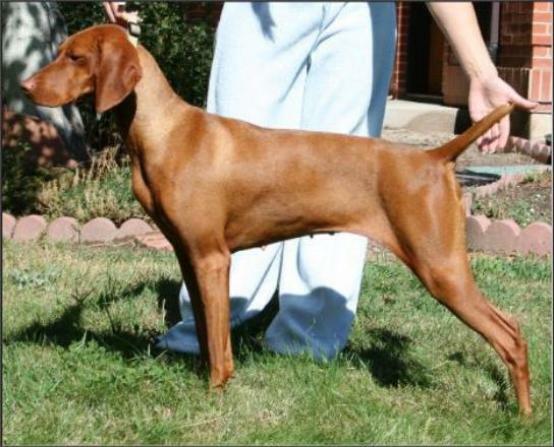 Secret is a "Storm Daughter", she easily attained her Champion (CH) title. She is a beautiful girl, her movement in the ring was effortless. She was a wonderful mother! OFA Hips VZ-10796G24F-VPI "Good", OFA Thyroid VZ-TH305/24F-VPI "Normal", CERF Eyes VZ-733 "Normal"
Sire: CH Russet Leather Storm Winds SH "Storm"
Dam: CH Encounter's Raina Reigns "Raina"
Breeder Sheila Denzler "Encounter Vizslak"
Offspring: Multiple Champion (CH) and Junior Hunter (JH) titles.